The Welkin Suite gives you the abilities to synchronize the structure of your project with Salesforce. This means that all changes that you make in the structure of your project locally can also be traced to your Salesforce org if you enable this option. NB: The ability to sync custom project structure is available for Sandboxes and Developer orgs only. However, this also works the other way: if your org already contains the data about a custom structure of the project, you can choose to update your local project's structure in accordance with it. To do so, you need to enable synchronization first. 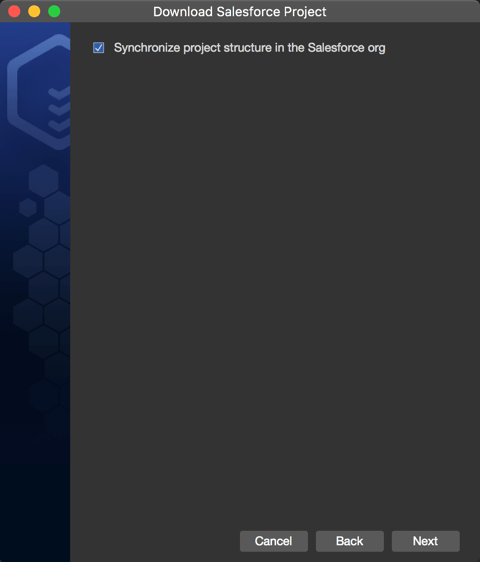 When creating the project in TWS, you can see the option Synchronize project structure in the Salesforce Org. Navigate to the Main Menu: Project ⇒ Enable project structure sync. Right-click on the project name in the Solution Explorer and select Enable project structure sync in the context menu. 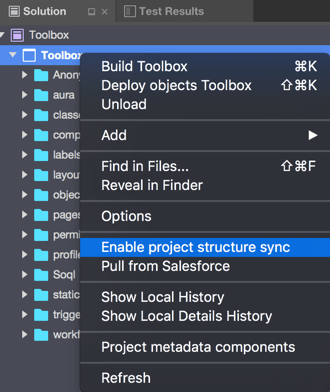 To disable the sync, go the same way: instead of the option Enable project structure sync you will see the Disable project structure sync. The synchronization process occurs after you make any changes to your project's structure: drag&drop, create / delete a file or folder. Any time you perform one of these actions, you will be notified by this system message. In case any errors occur, you will be given a warning message. Here are a few details about the synchronization after each type of actions, and most common errors that may occur when syncing your project structure. Drag and drop. After dropping, the project structure is synced and the file is moved to the new location. In cases a file with the same name already exists, a folder does not exist, or the file location was changed, you will get a warning message asking you to pull first. Files deletion. After you delete the file, it is also deleted in your SF org, and the record about this file is removed from the SyncData file. Folders deletion. After you delete the folder, it is also deleted in your SF org. However, the folder you are deleting should not have any child files / folders. In such a case, and if there is no data about the target folder in the SyncData file (meaning it was deleted before), you will get a warning message. Files creation. Once the file is created, the information about this file is saved in the SyncData file. In case the folder in which you are creating the file no longer exists, you will get a warning message. Folders creation. Once the folder is created, this change is recorded in the SyncData file. If the check of the SyncData file shows that the parent folder was deleted, or the target folder already exists, you will be notified in a warning message.